Native resolution refers to the maximum number of pixels that your monitor can display! In fact, all LCDs have a fixed number of pixels! ► ... native resolution - Wiki! Even if you set a higher resolution, the monitor can not display more pixels than it is able to. Scaling techniques will be used to display an image with a non-native resolution on the screen. For this reason, it is recommended to run the screen in the appropriate native resolution . At higher video resolution than supported by monitor, or graphics card! You may get a distorted picture, or no picture at all. Whether out of curiosity, or to improve the video performance, many users want to exploit the maximum resolution of their computer, laptop, notebook, monitor. See also: ... change the Windows screen resolution, two solutions! Custom resolution is not the native resolution! 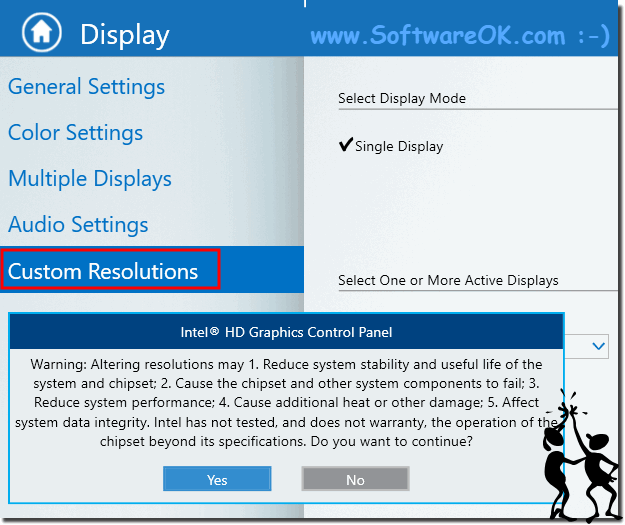 (Image-1) Custom Resolution on Intel Graphics Card! Glossar - FAQ-59: What is native resolution?